Discussion in 'Site Announcements' started by sothis, Feb 27, 2014. The announcement you've been waiting for is arrived - we've partnered with Crunchyroll to bring you thousands of episodes of legal anime that you can watch here on Anime-Planet! 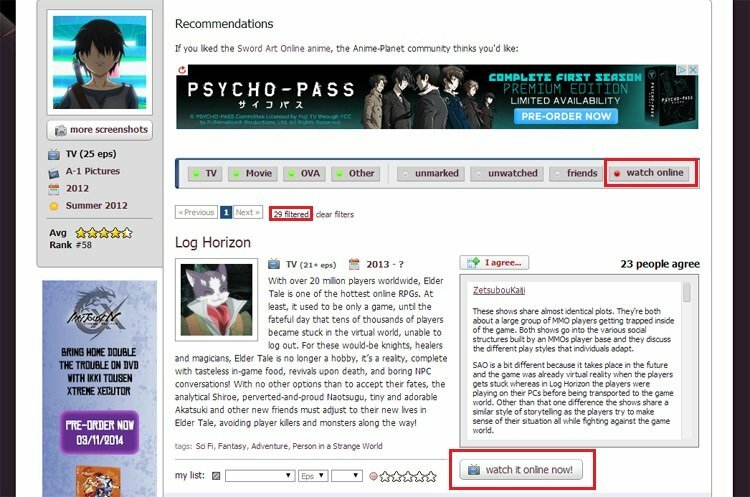 SEATTLE — Anime-Planet, the world’s most reputable recommendation database for anime and manga that serves 500,000 users a month, now supports in-depth Crunchyroll video integration. The site has partnered with Crunchyroll, a leading provider of streaming anime, to allow users to watch Crunchyroll’s thousands of legal streaming videos directly from Anime-Planet. 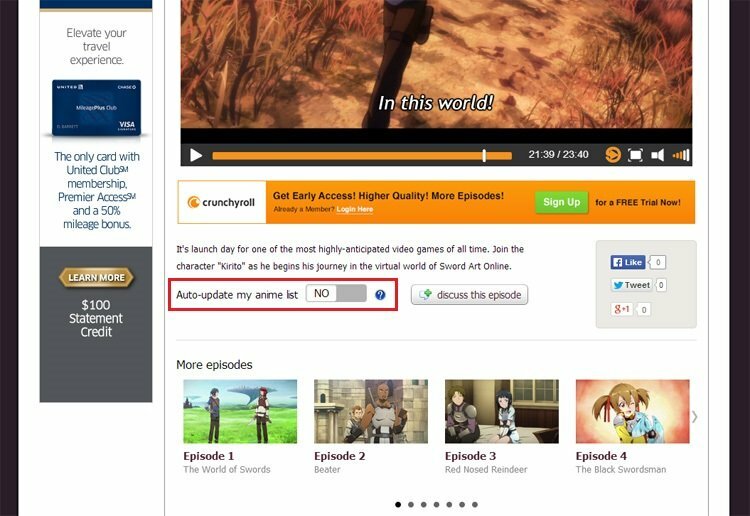 What’s more, members can opt-in to have their Anime-Planet watch lists automatically updated when viewing videos on the site. With this partnership, Anime-Planet becomes the first and oldest recommendation resource and social anime community to provide a feature of this type. Kim Cameron, CEO and founder of Anime-Planet, said the partnership came about because of a mutual interest with Crunchyroll to make legal streaming anime more available. "Anime-Planet's goal is to become a go-to place for industry-supported multimedia content, integrated into our powerful, reputable recommendation database. As Crunchyroll is an industry leader in bringing anime to the masses, and as Anime-Planet shares Crunchyroll’s desire to give fans an easy way to find new anime via the recommendation database, it was a perfect fit for partnership,” she said. Ms. Cameron hinted that this feature is only the first step in a larger effort to integrate Anime-Planet with anime’s industry leaders, making it easier for users to watch, review, and organize their anime lists from a single, unified source. 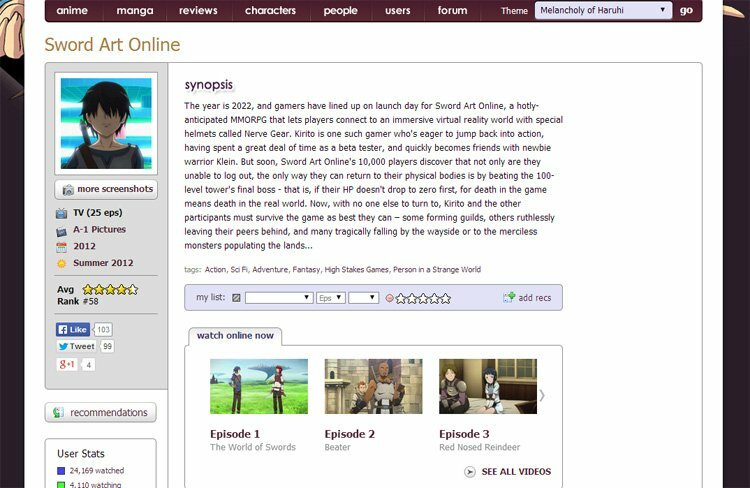 Anime-Planet was created in 2001 as the first anime recommendation database, enabling users to easily get and give recommendations for what to watch next. The site also features manga recommendations, personal anime and manga lists of what you’ve seen and read, and hand-written encyclopedia content for anime, manga, characters and beyond. For more information, visit http://www.anime-planet.com. Crunchyroll is the leading global video service for Japanese Anime and Asian media. Crunchyroll has over 25,000 videos and 12,000 hours of Anime, Korean Drama and Live-Action titles on Crunchyroll.com and Crunchyroll-powered platforms including iPhone, iPad, Android, Apple TV, TV set-top boxes, Playstation®3, Playstation®4, Xbox LIVE, and other devices. For more information, visit http://www.crunchyroll.com. and we'll update your anime list for you when you watch a video on Anime-Planet. When you watch the last episode of a series, your status will change to 'watched', as well! Once you've linked your twitter or facebook accounts in your profile, you'll see a new option to auto share when you watch videos on the site. This is an opt-in feature. Most content on Crunchyroll is free for anyone to watch - you can also become a premium member to get quicker access to brand new episodes, get HD, and support the industry at the same time. Like on the CR site, content that's premium-only has the tiny crown overlay on the thumbnails. Videos on Anime-Planet follow Crunchyroll's region locking parameters, so if you're able to watch it on CR, you're able to watch it on AP. We don't currently hide videos if you're in the wrong region, but plan to add that functionality shortly. Can I link my Anime-Planet account with my Crunchyroll account? Currently no - Crunchyroll doesn't provide a way for us to partner that deeply yet, but as we move forward we're looking into ways that we can provide an even better level of integration. When does my list auto-update when I watch a video? What are the auto updating caveats? We'll never change your status from 'watched' back to 'watching'. You'll need to go manually change your status to something else if you want us to increment your episode count when watching videos. If you don't have the series in your list yet, or have it in your list as any status other than 'watched' or 'watching', we'll first change your status to 'watching'. We'll never subtract episodes from your list - only add. For example, if you watch Naruto episodes 1-10 on Anime-Planet and then go back and watch episode 4 again, you'll see a feed update that you watched episode 4 on Anime-Planet, but your episode count will not go back to 4; it will stay at 10. This is a V1 feature and we're always up for hearing feedback about how to improve it. How do videos show up in my feed? Any time you watch a video, you'll see a new update in your feed. If you've turned on auto update, you won't see separate status updates when you watch a video. So if you watch Naruto episode 1, you'll see one feed update for 'watching Naruto episode 1 on Anime-Planet', and will NOT see a duplicated 'Watching Naruto at 1/x episodes' feed update. I love this feature! How can I show my support for Anime-Planet? The #1 thing you can do is to help spread the word about videos on Anime-Planet to everyone you know - whether on your anime blog, your website, on twitter/facebook, or just to your friends who love anime! Even if you know people who love anime and don't currently use the site, we'd love if you could tell others what you love about the video feature so they'll come try it out too. Additionally, if you've always wanted to donate to the site but haven't had a way, and if you've been on the fence about getting a Crunchyroll premium membership in the past (or have a dusty, expired account), PLEASE CONSIDER GOING PREMIUM! By signing up for a free trial and then becoming premium through any of our Crunchyroll links on Anime-Planet, you're not only directly supporting the industry, you're helping Anime-Planet stay afloat as well by being able to cover the pricy server costs and other expenses it takes to keep a site like this running. As the press release hints at, we have some really exciting stuff coming up in the future. We originally planned to hold some of it back until the big redesign was done, but as that's still some months away, we'll likely have another big announcement to make shortly. Stay tuned, and thanks as always for your support of A-P! This looks like an awesome addition to the site. Its really nice to see the site constantly evolving and I look forward to more new features in the future, great work. Great update. Well played, A-P team! Hurray for a shiny new feature! I'm glad to finally see it in action. Good job, everyone! I do need to grab myself CR premium soon, but i really like this new partnership! I had no idea this was happening, but it's still a really nice addition to the site. Good work. Seems the site continues to grow and evolve, also i think this will increase more so the traffic coming by the site here, as stated it's undeniable crunchyroll is the worlds top streaming site for fans so partnering up as the best recommendation database site will sure increase numbers as well. That's a good point - I was only looking at it from the perspective of USA regioning (because that's where my IP is). It could be that certain countries have more 'premium-only' videos. What's the default quality of the videos, and is there any way to change on the site? Rock on! Love this site. A-P Scores!! For the Win!!! New feature rollout does not disappoint! This is HUGE!!! Ability to see anime on the site directly? Huge! Awesome! Definitely will bring in more traffic!!!!! -AND- partnered with Crunchyroll, a well known and respected brand. Too cool, eh? Nice job! I'm curious, for those of you in other countries who are running into the 2 min clips, do you see the crown image on the thumbnails? I said it on Facebook but THIS IS AMAZING! COGRATS ANIME-PLANET! I am so proud of you! EDIT: Here in Canada I saw no crowns on the Sword Art Online videos but could also watch more than 2 minutes on the one video I clicked. EDIT II: I saw no crowns on Another, but I saw one crown on the most recent episode of Shippuden, and it only allowed 2minutes, but the episode before allowed over 2 minutes.